TS POLYCET Counselling Required Documents List 2019 updated. Aspirants can check the below details to get the Polytechnic Common Entrance Test Counselling Certificates List. So, the candidates qualified in the TS POLYCET 2019 can view the required documents for tspolycet.nic.in (Or) www.sbtet.telangana.in TS CEEP Certificate Verification. Every year State Board of Technical Education and Training will conduct the TS CEEP Exam. So, many candidates all over the Telangana applied for the TS POLYCET Exam. The candidates registered successfully attended the exam. Recently, SBTET Released the Results. Most of the candidates qualified in the exam and now they are searching for the documents required for the Common Entrance Test for Polytechnic 2019. So, to make your search easier here, we have provided complete details regarding the Polytechnic Entrance Exam Counselling Process. Therefore, interested aspirants can check to get more information regarding TS CEEP on this page. You can also get TS POLYCET Counselling Dates 2019 here. Name of the Board Telangana State Board of Technical Education & Training. Name of Exam Telangana State Polytechnic Common Entrance Test. You have to know that the first thing in the Counselling process is the certificate verification. So, the aspirants can verify their certificates at any one of the helpline centres. Therefore, everyone must attend this process. Otherwise, you are not eligible for the TS Polycet Web options entry. So, the candidates must keep all these documents with you during the Counselling time. After completion of Counselling Procedure, the SBTET will allocate the seats to the eligible candidates. So, the interested candidates can check the below details and can appear for the TS POLYCET Counselling 2019. So, the candidates who want to pursue their professional studies can appear for the Telangana Polytechnic Common Entrance Test Counselling process 2019. Along with the documents list, we have also provided the certificates order. Maintaining the documents in particular order will be helpful to you during the TS POLYCET Certificate Verification. So you need not hurry at the time of the Counselling Process. Some documents like caste and Income may take some time to acquire so the candidates can get them in time if you have an idea about the TS POLYCET Counselling Required Documents List. Physically Challenged (PH) / Children of Armed Personnel (CAP)/ NCC/ SPORTS/ Minority Certificate, if applicable. PH: Certificate issued by District Medical Board. Candidates with 40% and above disability are only eligible. CAP: Certificate issued by Zilla Sainik Welfare Officer, Identity card and Discharge book ( in the case of ExService men) and Service Certificate (in the case of in-service men) issued by Competent Authority for verification. Candidates whose parents are domiciled in the State of Telangana based on the permanent address/hometown declared by them while joining the service and as recorded in their Service Register are alone eligible to be considered under “CAP” Category. Minorities: SSC TC containing Minority Status or Certificate from the Head Master. Anglo-Indian: A Certificate issued by Tahsildar of their place of Residence. 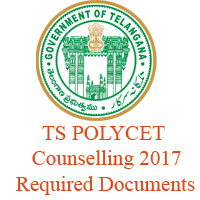 We have given the complete information about the TS POLYCET Counselling Required Documents. The information provided above is only for the reference of the aspirants. So, the candidates can check the official website for more details. We have provided the direct link to the official site on this page. So you can visit our website regularly for the latest updates.